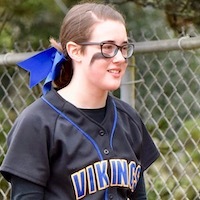 The Siuslaw Vikings softball team returns to the Sky-Em League with a veteran team and a seasoned head coach. Vikings coach Sean O'Mara has settled on a 12-player roster that includes 6 seniors, 2 juniors, 3 sophomores and freshman phenom Bailey Overton. All six juniors on last year's roster return, including outfielders Angela Bartlett, Lupita Figueroa, Audrey Lowder and Alyssa Richards, catcher Lexie Smith and infielder Hayley Meier. Junior pitcher Nina Aaron — the Lady Vikings' top pitcher from last season — and junior designated-hitter Liz Rosinbaum also return. Aaron was second-team all-league pitcher last spring, while her batterymate, Smith, was honorable mention. Siuslaw was 5-18 last season, including 4-11 in its final tour of the Far West League. The Lady Vikings open their season Wednesday in a nonleague game at Harrisburg. First pitch is 4 p.m.
Siuslaw has its home opener Wednesday, hosting Sutherlin in a nonleague doubleheader at 3 p.m. at the Siuslaw Softball Field. Wednesday, March 13 — at Harrisburg, 5 p.m.
Thursday, March 14 — Sutherlin (DH), 3 p.m.
Tuesday, March 19 — at Pleasant Hill, 4:30 p.m.
Friday, March 22 — Pleasant Hill, 5 p.m.
Tuesday, April 2 — Douglas (DH), 3 p.m.
Tuesday, April 9 — at Marist, 5 p.m.
Friday, April 12 — Junction City (DH), 3 p.m.
Tuesday, April 16 — Cottage Grove, 5 p.m.
Friday, April 19 — at Elmira (DH), 3 p.m.
Tuesday, April 23 — at Marshfield, 5 p.m.
Friday, April 26 — Marist (DH), 3 p.m.
Tuesday, April 30 — at Junction City, 5 p.m.
Friday, May 3 — at Cottage Grove (DH), 3 p.m.
Tuesday, April 7 — Elmira, 5 p.m.
Friday, April 10 — Marshfield (DH), 3 p.m.